This easy meat-free meal can be ready to eat in just 30 minutes. Preheat the oven to 200°C, gas mark 6. 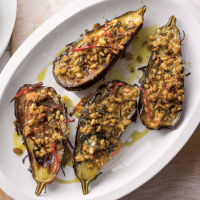 Place the aubergines on a baking tray, cut-side up, and sprinkle over the chilli, 1 tbsp of he oil and seasoning. Bake for 15 minutes. Meanwhile, mix together the remaining oil, pine nuts, basil and cheese. Spoon over the aubergines and bake for a further 5 minutes. Great served with rocket salad and crusty bread.